Heat oven to 425°F. Remove pie crusts from pouches; unroll on work surface. With 3 1/2- or 4-inch round cutter, cut 7 rounds from each crust; discard scraps. In small bowl, mix sugar and cinnamon. Dip both sides of rounds into cinnamon sugar to coat. Fit rounds into 14 ungreased regular-size muffin cups, pressing in gently. Bake about 8 minutes or until edges are golden brown. Cool completely, about 15 minutes. 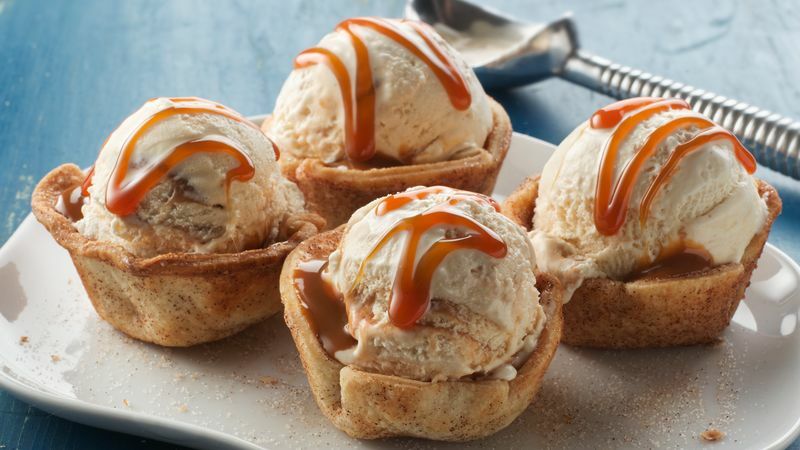 Place heaping teaspoonful dulce de leche in center of each cooled pie cup. Top with a scoop of ice cream. Top with caramel sauce. Serve immediately, or store in freezer up to 30 minutes before serving. Use vanilla ice cream in place of the caramel ice cream. Store leftovers tightly covered in freezer up to 3 days. Thaw slightly before serving.